Joyride's bar golf is a fun, unique way to explore the city's best bars- competitively! Bar golf is a a recreational drinking game involving a selection of five bars, creating a "course" to be played golf style. It's your traditional pub crawl transformed into a game. Remember - in golf, the lowest score wins! Visit Nashville's best bars while playing your finest round of golf ever. Joyride's Bar Golf provides your group with your very own private golf cart and caddie, a mobile putting green, a set of putters, and fun for everyone. You will visit five local bars, and your score is calculated based on your putting ability and any penalties. As with golf, the person with the lowest scores wins at the end of the game. Drinks are not included. 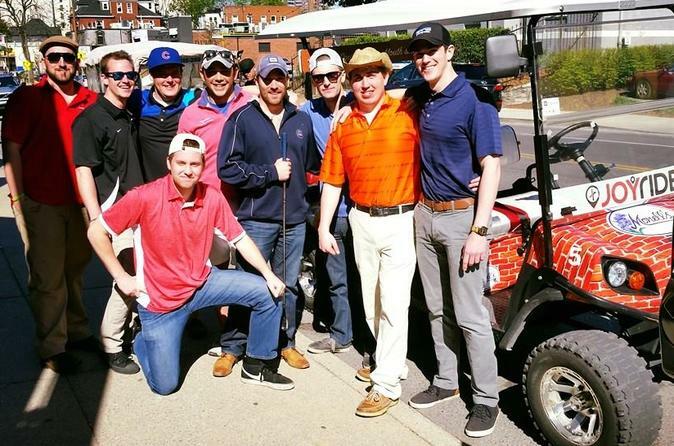 Bar golf is best suited for larger groups for more competition, but is great for anyone wanting to combine Nashville's bar scene with a unique experience. Dressing up is encouraged; laughter and fun are guaranteed. Have a blast with your group visiting the best hangouts in town and earning bragging rights along the way.